Nya is just the most sweet, gentle girl. She is an affectionate, loving dog that will make a great addition to her new family. Nya is easy going and adapts well. She loves walks, both short and longer. She rides well in the car, settling quietly in the back seat. She has a great nose and loves to sniff when on walks, and will scent the air for any treats at home. She would love one of those hide the treat games for dogs! Nya met the little dog in her foster home without any issues. Nya did try to play but her foster dog sister is older and much smaller, so hasnt been much of a playmate for Nya. So Nya started playing with her little stuffed squeaky toys on her own. She will toss them in the air and try to catch them. She is always wagging her tail, and wags while playing with her squeak toy…its so cute! Nya has been blind for some time, and her eyes were painful. They were recently removed, but the loss of them will only benefit how she feels. 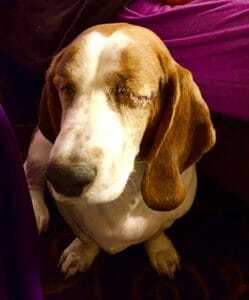 She is very well adapted and as most blind dogs do, has completely learned her foster home…can navigate the house, yard and stairs without issue. Prior to coming to rescue, Nya was happy and safe in a loving home with an extended family. However, in her blindness, Nya sometimes bumps into your leg when walking with you to make sure that you are there. This became hazardous for the grandmother in her family, so they made the very difficult decision to rehome Nya. The good news is that Nya has a stable loving background and this shows in her sweet personality. Please consider adding Nya to your family. She is a special girl. Nya is a healthy young adult dog. She had glaucoma that caused her blindness and pressure in her eyes that was painful. 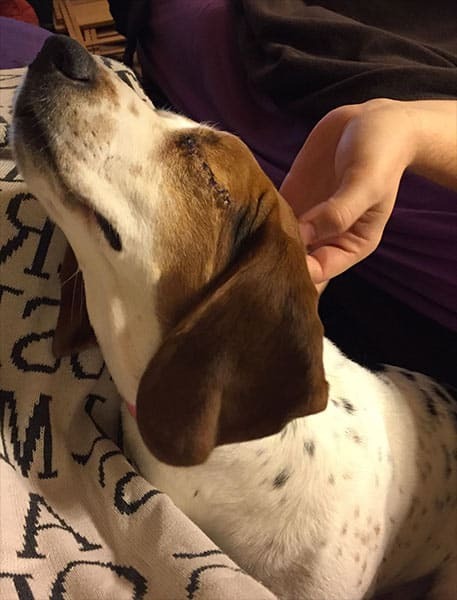 Her eyes were removed, and she is well adjusted. Nya is looking for her forever home. If you think it could be yours, read more about Adopting from BDRA before submitting your application below. BDRA relies on your donations to rescue blind dogs around the United States. Please consider giving in support of Nya.